Many 'icons' pass through London, including those of pop, film and fashion, but the capital is also home to a thriving holy icon scene. RBTH investigates how icons of the more contemplative, painted variety are gaining a growing following. Cumberland Lodge is a 17th Century mansion situated in the heart of Windsor Great Park, on the Crown Estates. An educational charity, its patron is the Queen. I am here to meet Irina Bradley, a professional iconographer, visiting tutor at the Prince’s School of Traditional Arts, and the artist behind an iconic exhibition adorning the panelled walls of its stately reception rooms: Return to Inner Sense. Icons are painted figures of saints or the holy family and events associated with them. The key difference between icons and Western religious painting is that in the Eastern Orthodox tradition icons are venerated as part of the liturgy. Strict rules govern composition and how holy figures are depicted. “Iconography is a language”, says Bradley, “and if you want to change the grammar, there had better be a good reason for it”. Traditionally icons are not signed; the work of an iconographer is to renounce ego and submit to the will of God. Icons are outside of time and space as the material world understands these categories. In this context architectural elements, such as buildings, in icons can be considered symbolically as the representation of the inner spiritual realm. There are no shadows in icons; everything is penetrated by the divine light. Reverse perspective is used, with lines converging towards the viewer, inviting them into the spiritual world inside the frame. What is immediately striking is how modern some of the ancient pieces appear. Avant-garde masters Kandinsky and Malevich were famously obsessed with icons; Matisse documented his fascination for the genre in a 1911 letter to Picasso from Moscow: "Until you’ve seen icons, you haven’t understood colour". Creating an icon is a complex process, a strict series of steps, little changed in thousands of years. Three to four days are spent preparing the lime, cedar or poplar wood board. Rabbit skin glue is then carefully boiled to prime the board. A muslin cloth is glued in place and 12 layers of gesso applied. Once dry, the board is sanded to perfection. Only then can a scene be created. It is an intricate work, involving complicated techniques for applying traditional pigments mixed in egg tempera. Bradley says the process is about transformation, gradually revealing the beauty of natural materials. Humble ingredients - clay, egg yolk, vinegar, chalk, ground, powdered minerals, linseed oil and a splash or two of boiled beer, are transformed into refined and delicate work. The final stage is oiling the work. “One slip at this stage”, says Bradley, “and all the hard work will be jeopardised”. If the intricate process is designed to foster intense focus it is with good reason. Icon painting has its roots in contemplative prayer, a meditative practice that was widespread in Byzantine monasteries. Richard Temple, an authority on Byzantine art of The Temple Gallery in London’s Holland Park, says: “The calm presence, the intense inner contemplation of the anonymous monks and craftsmen who created an icon hundreds of years ago is the artistic energy that radiates through the best examples”. Temple founded the gallery in 1959, after acquired his first icon while still at school for £11 in a bric-a-brac store off London’s St Martin’s Lane. Later he took the icon for appraisal at the National Gallery, only to be told, ‘we don’t consider this art’. Undaunted, Temple’s passion remains the backbone of a successful business. Thousands of valuable icons have passed through Temple’s hands and he continues to campaign for a section of the British Museum to be dedicated to the genre. “I know where every icon is and every icon knows where I am”, he says mysteriously. Temple first went to Russia in 1966, and remembers watching England's World Cup win over Germany on a television in the bar of the Evropeyskaya Hotel in St. Petersburg. “My love of icons is inextricably linked with my love of Russia”, he remarks. During subsequent trips to Russia he would spend days in museums, where he formed lasting friendships with Soviet curators and academics. He was impressed by "the extraordinary phenomenon of educated people living a non-materialistic life”, and was also able to track down some splendid icons. The hunt for icons can be as challenging as that for the Holy Grail. In ancient times, old boards would be repainted when their oil coating turned black. Stripping back layers sometimes reveals a true treasure. Most icons are of little interest, but occasionally a true gem is found. Icons in Temple's gallery sell for £1,500-£5,000, but when a genuine museum-quality piece turns up bidding is intense. Restoring icons is a controversial; Temple compares it to plastic surgery for mature women. Interest in painting, viewing and acquiring icons, goes far beyond Russian circles and major exhibitions have been hosted at New York's Metropolitan museum and London's Royal Academy and V&A. 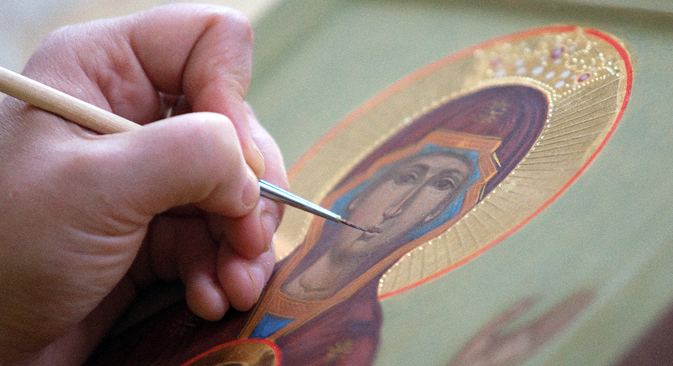 Courses in icon painting are increasingly popular and the best icons demand ever greater prices. It is only the academic establishment, it seems, that is embarrassed to accept icons as anything other than a religious art form. The British Museum turned down an offer from a wealthy benefactor to build a dedicated room for icons and declined an appeal from Prince Charles, but supporters have not given up, quietly confident that the unworldly beauty of icons transcends the tides of fashion and ideology.